The 2014 Minnesota Vikings season was the franchise's 54th season in the National Football League and the first under head coach Mike Zimmer. It was the first of two seasons in which the Vikings played at the outdoor TCF Bank Stadium on the campus of the University of Minnesota. Construction of U.S. Bank Stadium began on the site of the Hubert H. Humphrey Metrodome, with a target of opening for the 2016 season. Though the Vikings were eliminated from postseason contention after a loss to the Detroit Lions in Week 15, they improved on 2013's 5–10–1 record, which saw them go through a quarterback carousel and one of the worst defenses in the league that year, and arguably in Vikings' history. 1 2 3 The Vikings traded their original first-round selection (No. 8 overall) to the Cleveland Browns in exchange for the Browns' first- and fifth-round selections — Nos. 9 and 145 overall. The No. 9 selection had previously been acquired by the Browns in a trade with the Buffalo Bills. 1 2 3 The Vikings traded their second- and fourth-round selections (Nos. 40 and 108 overall, respectively) to the Seattle Seahawks in exchange for the Seahawks' first-round selection (No. 32 overall). ↑ The Vikings acquired this third-round selection as part of a 2013 trade that sent wide receiver Percy Harvin to the Seattle Seahawks. 1 2 3 4 5 6 The Vikings traded their original fifth-round selection (No. 148 overall) to the Carolina Panthers in exchange for the Panthers' fifth- and seventh-round selections — Nos. 168 and 225 overall. The No. 225 selection had previously been acquired by the Panthers in a trade that sent linebacker Jon Beason to the New York Giants. The Vikings then traded the No. 168 selection to the Atlanta Falcons in exchange for the Falcons' sixth- and seventh-round selections (Nos. 182 and 220 overall, respectively). ^[RFC] Denotes this is a reserve/future contract. ^[PS] Denotes a signing to the Practice Squad. MIN – Matt Asiata 1-yard run (Blair Walsh kick), 8:27. Vikings 7–0. Drive: 10 plays, 70 yards, 5:28. MIN – Blair Walsh 30-yard field goal, 0:54. Vikings 10–0. Drive: 10 plays, 42 yards, 5:28. OAK – Matt McGloin 10-yard run (pass failed), 1:25. Vikings 10–6. Drive: 9 plays, 56 yards, 2:32. Coming off a season in which the Vikings let almost every team score at least 20 points on them (including the preseason), the Vikings showcased a defense that held the Raiders to a single digit score and kept them scoreless until the last 90 seconds of the 4th quarter, when they eventually scored a touchdown. This was the first time the Vikings' defense held any team to a single digit score since week 16 of the 2012 season. Rookie Anthony Barr recorded half a sack, and Kurt Coleman intercepted Raiders quarterback Derek Carr once. On the offense, Matt Cassel started and shined on his sole drive, leading the team down the field, where Matt Asiata scored the Vikings' only touchdown of the game from a yard out. 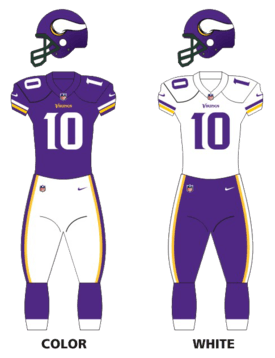 After Cassel's drive, rookie quarterback Teddy Bridgewater entered the game and played a few drives, completing 6 of 13 pass attempts for 49 yards, getting sacked twice, and fumbling once (fellow Viking Matt Kalil recovered the fumble). The Vikings got a field goal on the second drive. Shortly after the half, the signal calling was turned to Christian Ponder, who managed a pair of first-down passes of 17 and 15 yards early on, but produced little thereafter. ARI – Jonathan Dwyer 1-yard run (Jay Feely kick), 9:36. Cardinals 7–0. Drive: 9 plays, 93 yards, 3:26. MIN – Blair Walsh 21-yard field goal, 2:01. Cardinals 7–3. Drive: 13 plays, 65 yards, 7:35. MIN – Matt Cassel 51-yard pass to Kyle Rudolph (Blair Walsh kick), 14:25. Vikings 10–7. Drive: 2 plays, 62 yards, 0:35. ARI – Drew Stanton 1-yard pass to Darren Fells (Jay Feely kick), 3:05. Cardinals 14–10. Drive: 11 plays, 59 yards, 6:07. MIN – Blair Walsh 34-yard field goal, 0:50. Cardinals 14–13. Drive: 7 plays, 35 yards, 2:15. ARI – Robert Hughes 2-yard run (Jay Feely kick), 4:54. Cardinals 21–13. Drive: 19 plays, 80 yards, 10:06. MIN – Blair Walsh 21-yard field goal, 14:53. Cardinals 21–16. Drive: 9 plays, 89 yards, 5:01. MIN – Teddy Bridgewater 3-yard pass to Allen Reisner (Bridgewater–Wright pass), 7:57. Vikings 24–21. Drive: 10 plays, 68 yards, 4:55. ARI – Zach Bauman 6-yard fumble recovery (Jay Feely kick), 1:11. Cardinals 28–24. Drive: 5 plays, 49 yards, 0:38. MIN – Teddy Bridgewater 2-yard pass to Rodney Smith (kick failed), 0:18. Vikings 30-28. Drive: 7 plays, 83 yards, 0:53. The Vikings faced a Cardinals team that shut the Texans out 32–0 in week 1. The Cardinals strained the Vikings' defense, but the offense, headed by Matt Cassel in the first half, was able to keep pace with their scoring to see the Vikings trailing 14–13 at halftime. The Vikings switched to Teddy Bridgewater after the half, and the rookie quarterback orchestrated a pair of drives that put the Vikings back in the lead 24–21. A few drives later, the Vikings' defense would end up being penalized three straight times, allowing the Cardinals to score a touchdown through a botched snap that was recovered by the Cardinals and run into the end zone. The Vikings were given the ball with around a minute to score. Bridgewater led the Vikings down field in comeback fashion to score the game-winner with a pass to Rodney Smith, sealing another preseason victory for the Vikings. MIN – Matt Cassel 53-yard pass to Cordarrelle Patterson (Blair Walsh kick), 9:56. Vikings 7–0. Drive: 5 plays, 97 yards, 2:55. KC – Matt Cassel fumble forced by Jaye Howard out of bounds in end zone for a safety, 3:42. Vikings 7–2. KC – Cairo Santos 21-yard field goal, 2:59. Vikings 7–5. Drive: 14 plays, 77 yards, 7:43. MIN – Blair Walsh 41-yard field goal, 1:07. Vikings 10–5. Drive: 5 plays, 30 yards, 0:29. MIN – Blair Walsh 32-yard field goal, 4:40. Vikings 13–5. Drive: 9 plays, 49 yards, 4:33. MIN – Teddy Bridgewater 8-yard pass to Allen Reisner (Blair Walsh kick), 2:08. Vikings 20–5. Drive: 3 plays, 8 yards, 0:55. MIN – Teddy Bridgewater 5-yard pass to Allen Reisner (Blair Walsh kick), 0:24. Vikings 27–5. Drive: 1 play, 5 yards, 0:05. MIN – Blair Walsh 28-yard field goal, 4:16. Vikings 30–5. Drive: 11 plays, 73 yards, 5:45. KC – Tyler Bray 1-yard pass to Albert Wilson (Cairo Santos kick), 0:25. Vikings 30–12. Drive: 9 plays, 80 yards, 3:51. The Vikings traveled to Kansas City to play against Matt Cassel's former team. The defense played remarkably well, with Captain Munnerlyn, Chad Greenway and Shaun Prater each recording an interception. The Vikings' defense managed to hold the Chiefs to five points for a majority of the game until they got a touchdown in the final minute for a total of 12. For the third game running, Cassel was the starting quarterback and he played the majority of this game; he gained 152 passing yards with a touchdown pass to Cordarrelle Patterson, and threw a pick, the Vikings' only turnover of their preseason. Bridgewater also saw a little action; though he made few pass attempts, he gained 40 passing yards and made two touchdown passes to Allen Reisner. MIN – Teddy Bridgewater 3-yard pass to Adam Thielen (Blair Walsh kick), 8:54. Vikings 7–0. Drive: 12 plays, 80 yards, 6:06. MIN – Blair Walsh 45-yard field goal, 13:26. Vikings 10–0. Drive: 15 plays, 51 yards, 6:49. MIN – Blair Walsh 22-yard field goal, 5:03. Vikings 13–0. Drive: 9 plays, 60 yards, 4:23. MIN – Blair Walsh 35-yard field goal, 1:38. Vikings 16–0. Drive: 7 plays, 22 yards, 2:30. MIN – Blair Walsh 30-yard field goal, 2:40. Vikings 19–0. Drive: 14 plays, 68 yards, 8:17. TEN – Maikon Bonani 29-yard field goal, 7:08. Vikings 19–3. Drive: 15 plays, 69 yards, 7:43. The Vikings traveled to Tennessee to face the Titans in the preseason finale. The Vikings' defense excelled in keeping the Titans to a minimal score, and recorded a strip sack by Corey Wootton and an interception by Julian Posey. Teddy Bridgewater was the starter for this game, and led the Vikings to score 10 points in their first two drives. Christian Ponder then took over for the rest of the game, leading three more scoring drives, though he and the offense were unable to score any touchdowns. Note: Division rivals are marked with bold text. MIN – Blair Walsh 52-yard field goal, 9:37. Vikings 3–0. Drive: 11 plays, 56 yards, 5:23. MIN – Blair Walsh 46-yard field goal, 14:16. Vikings 6–0. Drive: 5 plays, 32 yards, 1:53. MIN – Greg Jennings 8-yard pass from Matt Cassel (Blair Walsh kick), 0:21. Vikings 13–0. Drive: 4 plays, 35 yards, 0:48. STL – Greg Zuerlein 56-yard field goal, 10:11. Vikings 13–3. Drive: 9 plays, 42 yards, 4:49. MIN – Cordarrelle Patterson 67-yard run (Blair Walsh kick), 1:54. Vikings 20–3. Drive: 1 play, 67 yards, 0:14. MIN – Kyle Rudolph 7-yard pass from Matt Cassel (Blair Walsh kick), 6:27. Vikings 27–3. Drive: 9 plays, 70 yards, 5:23. MIN – Harrison Smith 81-yard interception return (Blair Walsh kick), 2:57. Vikings 34–3. STL – Greg Zuerlein 46-yard field goal, 1:31. Vikings 34–6. Drive: 8 plays, 52 yards, 1:26. The Vikings opened their season on the road against the St. Louis Rams and took the lead in the first half with a field goal in each quarter from 52 yards and 46 yards, respectively, from third-year kicker Blair Walsh and an eight-yard touchdown pass from Matt Cassel to Greg Jennings with 21 seconds left in the half, set up by an interception from Josh Robinson at the Rams' 35-yard line. The Rams struck back early in the third quarter with a field goal from Greg Zuerlein before Vikings wide receiver Cordarrelle Patterson made the play of the game with a 67-yard touchdown run. The Vikings secured the game late in the fourth quarter as TE Kyle Rudolph connected with Cassel on a seven-yard touchdown pass, while Rudolph's former Notre Dame teammate Harrison Smith took an interception 81 yards for the Vikings' fourth touchdown of the game. Zuerlein added another field goal late in the game to make the final score 34–6 to the Vikings, their first road victory since week 16 of the 2012 season against the Houston Texans. MIN – Matt Asiata 25-yard pass from Matt Cassel (Blair Walsh kick), 10:54. Vikings 7–0. Drive: 7 plays, 80 yards, 4:06. NE – Stevan Ridley 1-yard run (Stephen Gostkowski kick), 6:14. Tied 7–7. Drive: 2 plays, 1 yard, 0:43. NE – Stephen Gostkowski 48-yard field goal, 0:32. Patriots 10–7. Drive: 10 plays, 40 yards, 4:11. NE – Julian Edelman 9-yard pass from Tom Brady (Stephen Gostkowski kick), 9:30. Patriots 17–7. Drive: 7 plays, 61 yards, 4:00. NE – Chandler Jones 58-yard return of blocked field goal (Stephen Gostkowski kick), 0:09. Patriots 24–7. NE – Stephen Gostkowski 47-yard field goal, 8:32. Patriots 27–7. Drive: 5 plays, 17 yards, 1:10. NE – Stephen Gostkowski 27-yard field goal, 14:57. Patriots 30–7. Drive: 11 plays, 46 yards, 6:49. The Vikings began their opening home game of the season without Adrian Peterson, who was deactivated after being charged with negligent injury of a child for allegedly beating his four-year-old son with a tree branch. He was replaced in the starting lineup by Matt Asiata, who got the Vikings off to a good start with a 25-yard touchdown reception from Matt Cassel on the game's opening possession. The defense then forced the Patriots into a three-and-out, only for Cassel to throw an interception attempting to find Jarius Wright deep downfield. Devin McCourty returned the ball 60 yards to the Minnesota 1-yard line, and two plays later, Stevan Ridley ran in to tie the scores. A second interception early in the second quarter resulted in another scoring drive for New England, as Tom Brady connected with Julian Edelman on a nine-yard TD catch. As the first half drew to a close, the Vikings drove downfield to give Blair Walsh a 48-yard field goal attempt with 19 seconds on the clock; however, Patriots DE Chandler Jones was able to burst through the Minnesota offensive line and block the kick before scooping up the ball and returning it 58 yards for the Patriots' third TD of the half. After the break, Cassel threw another two interceptions, one in each quarter, with the first resulting in a 47-yard Stephen Gostkowski field goal. The second occurred with six minutes left in the game, and the Patriots were able to hang onto possession until the two-minute warning before turning the ball over on downs at the Minnesota 19-yard line. Aided by two pass interference penalties, Cassel led the Vikings down the field and thought he had managed to cut into the New England lead with a 16-yard pass to Greg Jennings with 41 seconds to play, only for Jennings to be ruled out of bounds before gaining possession of the ball. Cassel was then sacked for a 14-yard loss on the next play and the game finished as a 30–7 Patriots win. NO – Pierre Thomas 1-yard run (Shayne Graham kick), 9:36. Saints 7–0. Drive: 11 plays, 80 yards, 5:24. NO – Josh Hill 34-yard pass from Drew Brees (kick blocked), 4:50. Saints 13–0. Drive: 7 plays, 82 yards, 3:39. MIN – Blair Walsh 25-yard field goal, 14:06. Patriots 13–3. Drive: 13 plays, 71 yards, 5:44. MIN – Blair Walsh 30-yard field goal, 6:28. Patriots 13–6. Drive: 10 plays, 51 yards, 5:47. MIN – Blair Walsh 40-yard field goal, 10:20. Patriots 13–9. Drive: 10 plays, 43 yards, 4:40. NO – Marques Colston 18-yard pass from Drew Brees (Shayne Graham kick), 12:22. Patriots 20–9. Drive: 12 plays, 90 yards, 5:28. After initially stating that Adrian Peterson would return to the active roster for their Week 3 game at New Orleans, the Vikings later placed the running back on the inactive list indefinitely, pending the outcome of the court case against him. Despite coming into the game at 0–3, the Saints started well, scoring two touchdowns on their first two drives, although DE Everson Griffen was able to block the extra point attempt on the second. The Vikings responded to going 13–0 down with two field goals from 25 and 30 yards respectively, but an injury to Matt Cassel meant a debut for rookie QB Teddy Bridgewater. K Blair Walsh hit a 40-yard field goal to open the second half for the Vikings, but New Orleans closed the game out with an 18-yard touchdown pass from Drew Brees to Marques Colston early in the fourth quarter. They were aided on the drive by a penalty for unnecessary roughness against CB Captain Munnerlyn for a tackle on Brees, but many thought that Brees should also have been penalized for his reaction and the penalties offset. Regardless, the Vikings were forced to punt on their next possession and the Saints were able to run out the clock for a 20–9 win. MIN – Matt Asiata 3-yard run (Blair Walsh kick), 9:27. Vikings 7–0. Drive: 8 plays, 73 yards, 5:24. ATL – Roddy White 24-yard pass from Matt Ryan (Matt Bryant kick), 3:56. Tied 7–7. Drive: 11 plays, 80 yards, 5:31. MIN – Matt Asiata 6-yard run (Blair Walsh kick), 1:31. Vikings 14–7. Drive: 5 plays, 53 yards, 2:25. ATL – Patrick DiMarco 1-yard pass from Matt Ryan (Matt Bryant kick), 5:56. Tied 14–14. Drive: 13 plays, 61 yards, 5:26. MIN – Teddy Bridgewater 13-yard run (Blair Walsh kick), 1:59. Vikings 21–14. Drive: 9 plays, 80 yards, 3:57. MIN – Blair Walsh 18-yard field goal, 0:02. Vikings 24–14. Drive: 10 plays, 84 yards, 1:23. MIN – Blair Walsh 41-yard field goal, 10:40. Vikings 27–14. Drive: 8 plays, 43 yards, 4:20. ATL – Devin Hester 36-yard pass from Matt Ryan (Matt Bryant kick), 7:19. Vikings 27–21. Drive: 7 plays, 80 yards, 3:21. ATL – Antone Smith 48-yard run (Matt Bryant kick), 1:31. Falcons 28–27. Drive: 4 plays, 63 yards, 1:16. MIN – Matt Asiata 1-yard run (Teddy Bridgewater–Rhett Ellison pass), 10:50. Vikings 35–28. Drive: 9 plays, 78 yards, 3:51. MIN – Blair Walsh 55-yard field goal, 3:38. Vikings 38–28. Drive: 5 plays, 18 yards, 2:51. MIN – Blair Walsh 33-yard field goal, 1:14. Vikings 41–28. Drive: 7 plays, 15 yards, 2:11. Having lost Matt Cassel for the season, the Vikings gave Teddy Bridgewater his first career start at home to the Falcons in week 4, but it was running back Matt Asiata who opened the scoring with a 3-yard touchdown run. Roddy White leveled the scores with a 24-yard catch from Matt Ryan, but a 49-yard kickoff return from Cordarrelle Patterson set the Vikings up with a short field on the next drive, which Asiata finished with a 6-yard run to restore Minnesota's seven-point lead. Steven Jackson thought he had tied the scores again on a 3-yard run with six minutes to go in the half, only for the touchdown call to be overturned on review; however, Ryan was able to find FB Patrick DiMarco in the flat on the next play. However, Bridgewater himself restored Minnesota's advantage on the ensuing possession, capping an 80-yard drive with a 13-yard touchdown run as the game entered its first two-minute warning. After forcing Atlanta into a quick three-and-out, Bridgewater led the Vikings downfield to the brink of another touchdown, but a lack of time meant they had to settle for an 18-yard Blair Walsh field goal to give them a 24–14 lead at the half. Walsh scored another field goal on the opening drive of the second half, but long touchdowns for Devin Hester and Antone Smith gave the Falcons a one-point lead going into the fourth quarter. Those would prove to be Atlanta's last points of the game as Asiata picked up his third TD run early in the fourth quarter, with Bridgewater adding two points with a pass to Rhett Ellison. Bridgewater was injured on that drive, meaning that third-string QB Christian Ponder came in for his first appearance of the season. However, his job was simply to hand the ball off to rookie running back Jerick McKinnon, who set up a 55-yard field goal attempt for Walsh. An interception by Harrison Smith led to another field goal from 33 yards, before Josh Robinson closed the game out with another interception. GB – Randall Cobb 8-yard pass from Aaron Rodgers (Mason Crosby kick), 9:39. Packers 7–0. Drive: 4 plays, 61 yards, 2:04. GB – Jordy Nelson 66-yard pass from Aaron Rodgers (Mason Crosby kick), 5:18. Packers 14–0. Drive: 4 plays, 81 yards, 1:32. GB – Julius Peppers 49-yard interception return (Mason Crosby kick), 6:51. Packers 21–0. GB – Davante Adams 11-yard pass from Aaron Rodgers (Mason Crosby kick), 4:51. Packers 28–0. Drive: 3 plays, 20 yards, 1:15. GB – Eddie Lacy 11-yard run (Mason Crosby kick), 10:33. Packers 35–0. Drive: 6 plays, 70 yards, 2:59. GB – Eddie Lacy 10-yard run (Mason Crosby kick), 3:42. Packers 42–0. Drive: 7 plays, 52 yards, 4:49. MIN – Christian Ponder 6-yard run (Blair Walsh kick), 14:54. Packers 42–7. Drive: 7 plays, 62 yards, 3:48. MIN – Blair Walsh 26-yard field goal, 10:07. Packers 42–10. Drive: 7 plays, 22 yards, 3:13. With only four days between games, Teddy Bridgewater had insufficient time to recover from the injury he picked up in week 4 and Christian Ponder made his first start since week 12 of the 2013 season. The Vikings defense forced Green Bay to punt on the first possession of the game, but soon kicked the ball back to the Packers, allowing Eddie Lacy's running to set up an 8-yard touchdown pass from Aaron Rodgers to Randall Cobb. The Vikings' ensuing possession again ended with a punt, and Rodgers punished them with a 66-yard TD pass to Jordy Nelson. The teams traded possession as the game moved into the second quarter, until Ponder threw the ball directly to Packers DE Julius Peppers, who returned the interception 49 yards for his team's third TD of the game. Two plays later, Ponder was picked off again, this time by LB Jamari Lattimore, leaving a short field for Rodgers to work into before throwing an 11-yard TD pass to WR Davante Adams. The second half began in much the same vein, as the Packers forced a Vikings punt on the first possession before marching downfield to set Lacy up for an 11-yard scoring run. The running back went into the end zone again at the end of the Packers' next possession with a 10-yard run, giving the home team a 42–0 lead. CB Marcus Sherels returned the ensuing kickoff 46 yards, and Ponder was able to pass downfield to the Green Bay 6-yard line, from where he ran into the end zone for the Vikings' first points of the game. Three plays later, Harrison Smith picked off a pass from Matt Flynn at the Green Bay 30-yard line, but the Vikings were unable to get into the end zone despite the short field and had to settle for a 26-yard Blair Walsh field goal. As the game drew to a close, the Vikings regained possession and drove down to the Packers' 8-yard line, only to be denied on 4th-and-goal, allowing Green Bay to end the game with a kneeldown. DET – Theo Riddick 9-yard pass from Matthew Stafford (Matt Prater kick), 11:06. Lions 7–0. Drive: 7 plays, 80 yards, 3:54. DET – Matt Prater 52-yard field goal, 0:07. Lions 10–0. Drive: 5 plays, 17 yards, 0:38. DET – Joique Bell 1-yard run (Matt Prater kick), 11:44. Lions 17–0. Drive: 14 plays, 60 yards, 7:54. MIN – Blair Walsh 40-yard field goal, 4:53. Lions 17–3. Drive: 11 plays, 45 yards, 4:21. MIN – Blair Walsh 40-yard field goal, 1:50. Vikings 3–0. Drive: 4 plays, 5 yards, 1:59. BUF – Sammy Watkins 26-yard pass from Kyle Orton (Dan Carpenter kick), 9:23. Bills 7–3. Drive: 1 play, 26 yards, 0:05. MIN – Cordarrelle Patterson 4-yard pass from Teddy Bridgewater (Blair Walsh kick), 6:17. Vikings 10–7. Drive: 5 plays, 60 yards, 3:06. BUF – Dan Carpenter 31-yard field goal, 4:01. Tied 10–10. Drive: 6 plays, 66 yards, 2:16. MIN – Blair Walsh 55-yard field goal, 0:15. Vikings 13–10. Drive: 5 plays, 22 yards, 1:04. MIN – Blair Walsh 33-yard field goal, 11:45. Vikings 16–10. Drive: 12 plays, 36 yards, 5:43. BUF – Sammy Watkins 2-yard pass from Kyle Orton (Dan Carpenter kick), 0:01. Bills 17–16. Drive: 15 plays, 80 yards, 3:06. MIN – Blair Walsh 46-yard field goal, 0:00. Vikings 3–0. Drive: 5 plays, 38 yards, 0:59. MIN – Greg Jennings 17-yard pass from Teddy Bridgewater (Blair Walsh kick), 7:09. Vikings 10–0. Drive: 6 plays, 63 yards, 3:09. TB – Patrick Murray 54-yard field goal, 14:12. Vikings 10–3. Drive: 5 plays, 15 yards, 1:27. TB – Patrick Murray 45-yard field goal, 7:19. Vikings 10–6. Drive: 7 plays, 53 yards, 3:44. TB – Austin Seferian-Jenkins 7-yard pass from Mike Glennon (Patrick Murray kick), 2:02. Tampa Bay 13–10. Drive: 9 plays, 71 yards, 3:38. MIN – Blair Walsh 38-yard field goal, 0:00. Tied 13–13. Drive: 9 plays, 61 yards, 2:02. MIN – Anthony Barr 27-yard fumble return, 14:43. Vikings 19–13. WAS – Kai Forbath 36-yard field goal, 6:16. Redskins 3–0. Drive: 13 plays, 62 yards, 7:49. WAS – Alfred Morris 14-yard run, 14:46. Redskins 10–0. Drive: 6 plays, 91 yards, 2:22. MIN – Chase Ford 20-yard pass from Teddy Bridgewater (Blair Walsh kick), 0:36. Redskins 10–7. Drive: 4 plays, 46 yards, 0:23. MIN – Matt Asiata 1-yard run (Blair Walsh kick), 10:44. Vikings 14–10. Drive: 6 plays, 56 yards, 2:15. WAS – DeSean Jackson 13-yard pass from Robert Griffin III (Kai Forbath kick), 7:23. Redskins 17–14. Drive: 7 plays, 56 yards, 3:21. WAS – Kai Forbath 26-yard field goal, 1:57. Redskins 20–14. Drive: 9 plays, 43 yards, 3:26. MIN – Matt Asiata 7-yard run (Blair Walsh kick), 13:00. Vikings 21–20. Drive: 10 plays, 76 yards, 3:57. WAS – Alfred Morris 2-yard run (run failed), 9:01. Redskins 26–21. Drive: 8 plays, 80 yards, 3:59. MIN – Matt Asiata 1-yard run (Matt Asiata run), 3:27. Vikings 29–26. Drive: 12 plays, 73 yards, 5:34. With the close win over the Redskins, the Vikings improved to 4–5. Teddy Bridgewater's third win as a starting rookie quarterback breaks the franchise record (two wins) shared by both Fran Tarkenton and Christian Ponder. The Vikings took their bye week in week 10, along with the Texans, Colts, Patriots, Chargers and Redskins. MIN – Blair Walsh 50-yard field goal, 11:21. Vikings 3–0. Drive: 7 plays, 39 yards, 3:39. MIN – Rhett Ellison 7-yard pass from Teddy Bridgewater (Blair Walsh kick), 3:16. Vikings 10–0. Drive: 5 plays, 63 yards, 2:46. CHI – Alshon Jeffery 27-yard pass from Jay Cutler (Robbie Gould kick), 13:06. Vikings 10–7. Drive: 10 plays, 81 yards, 5:10. CHI – Brandon Marshall 44-yard pass from Jay Cutler (Robbie Gould kick), 2:49. Bears 14–10. Drive: 4 plays, 73 yards, 1:47. CHI – Brandon Marshall 4-yard pass from Jay Cutler (Robbie Gould kick), 8:51. Bears 21–10. Drive: 16 plays, 72 yards, 7:35. MIN – Blair Walsh 26-yard field goal, 4:04. Bears 21–13. Drive: 9 plays, 52 yards, 4:47. GB – Eddie Lacy 7-run (Mason Crosby kick), 1:34. Packers 7–0. Drive: 6 plays, 54 yards, 3:10. MIN – Charles Johnson 22-yard pass from Teddy Bridgewater (Blair Walsh kick), 11:06. Tied 7–7. Drive: 14 plays, 74 yards, 5:28. GB – Richard Rodgers 1-yard pass from Aaron Rodgers (Mason Crosby kick), 5:23. Packers 14–7. Drive: 4 plays, 53 yards, 1:59. MIN – Blair Walsh 39-yard field goal, 0:16. Packers 14–10. Drive: 11 plays, 42 yards, 5:07. MIN – Blair Walsh 51-yard field goal, 6:42. Packers 14–13. Drive: 7 plays, 17 yards, 1:53. GB – Mason Crosby 48-yard field goal, 2:41. Packers 17–13. Drive: 9 plays, 50 yards, 4:01. GB – Eddie Lacy 10-yard pass from Aaron Rodgers (Mason Crosby kick), 8:34. Packers 24–13. Drive: 11 plays, 87 yards, 6:18. MIN – Greg Jennings 5-yard pass from Teddy Bridgewater (Teddy Bridgewater to Charles Johnson pass), 3:23. Packers 24–21. Drive: 13 plays, 79 yards, 5:11. MIN – Kyle Rudolph 4-yard pass from Teddy Bridgewater (Blair Walsh kick), 9:41. Vikings 7–0. Drive: 6 plays, 45 yards, 3:07. MIN – Adam Thielen 30-yard return of blocked punt (Blair Walsh kick), 7:00. Vikings 14–0. CAR – Graham Gano 30-yard field goal, 0:37. Vikings 14–3. Drive: 14 plays, 68 yards, 6:23. MIN – Everson Griffen 43-yard return of blocked punt (Blair Walsh kick), 9:35. Vikings 21–3. CAR – Graham Gano 35-yard field goal, 3:28. Vikings 21–6. Drive: 12 plays, 63 yards, 6:07. MIN – Greg Jennings 17-yard pass from Teddy Bridgewater (Blair Walsh kick), 0:16. Vikings 28–6. Drive: 11 plays, 80 yards, 3:12. CAR – Philly Brown 32-yard pass from Cam Newton (Graham Gano kick), 9:15. Vikings 28–13. Drive: 8 plays, 80 yards, 4:13. MIN – Blair Walsh 39-yard field goal, 8:55. Packers 31–13. Drive: 6 plays, 19 yards, 3:25. MIN – Gerald Hodges 27-yard interception return (Blair Walsh kick), 14:54. Vikings 7–0. NYJ – Sheldon Richardson sack for safety, 10:12. Vikings 7–2. NYJ – Percy Harvin 35-yard pass from Geno Smith (Nick Folk kick), 7:35. Jets 9–7. Drive: 5 plays, 65 yards, 2:37. MIN – Charles Johnson 56-yard pass from Teddy Bridgewater (Blair Walsh kick), 5:43. Vikings 14–9. Drive: 4 plays, 70 yards, 1:42. NYJ – Nick Folk 36-yard field goal, 2:28. Vikings 14–12. Drive: 6 plays, 17 yards, 3:25. MIN – Jerome Felton 0-yard fumble recovery (Blair Walsh kick), 13:44. Vikings 21–12. Drive: 7 plays, 58 yards, 3:56. NYJ – Nick Folk 33-yard field goal, 0:17. Vikings 21–15. Drive: 12 plays, 50 yards, 3:30. NYJ – Nick Folk 22-yard field goal, 12:24. Vikings 21–18. Drive: 6 plays, 22 yards, 2:32. NYJ – Nick Folk 24-yard field goal, 14:15. Tied 21–21. Drive: 11 plays, 65 yards, 5:48. MIN – Blair Walsh 20-yard field goal, 5:28. Vikings 24–21. Drive: 7 plays, 45 yards, 3:12. NYJ – Nick Folk 44-yard field goal, 0:23. Tied 24–24. Drive: 9 plays, 45 yards, 2:44. MIN – Jarius Wright 87-yard pass from Teddy Bridgewater, 10:35. Vikings 30–24. Drive: 3 plays, 92 yards, 1:39. With the overtime win, the Vikings improve to 6–7 and have therefore improved on last year's record. MIN – Matt Asiata 2-yard run (Blair Walsh kick), 0:16. Vikings 7–0. Drive: 10 plays, 84 yards, 5:09. MIN – Greg Jennings 8-yard pass from Teddy Bridgewater (Blair Walsh kick), 10:05. Vikings 14–0. Drive: 7 plays, 75 yards, 3:53. DET – Golden Tate 7-yard pass from Matthew Stafford (Matt Prater kick), 3:42. Vikings 14–7. Drive: 2 plays, 11 yards, 0:45. DET – Matt Prater 29-yard field goal, 0:00. Vikings 14–10. Drive: 7 plays, 21 yards, 3:00. DET – Matt Prater 30-yard field goal, 3:45. Vikings 14–13. Drive: 13 plays, 74 yards, 7:19. DET – Matt Prater 33-yard field goal, 3:38. Lions 16–14. Drive: 10 plays, 65 yards, 4:05. The loss resulted in the Vikings being officially eliminated from playoff contention. MIN – Matt Asiata 1-yard run (Blair Walsh kick), 4:23. Vikings 7–0. Drive: 10 plays, 54 yards, 5:36. MIN – Greg Jennings 21-yard pass from Teddy Bridgewater (Blair Walsh kick), 11:34. Vikings 14–0. Drive: 3 plays, 23 yards, 0:49. MIA – Dion Sims 14-yard pass from Ryan Tannehill (Caleb Sturgis kick), 4:53. Vikings 14–7. Drive: 12 plays, 92 yards, 6:41. MIN – Blair Walsh 18-yard field goal, 0:02. Vikings 17–7. Drive: 10 plays, 86 yards, 1:04. MIA – Mike Wallace 16-yard pass from Ryan Tannehill (Caleb Sturgis kick), 8:29. Vikings 17–14. Drive: 6 plays, 80 yards, 4:03. MIA – Lamar Miller 1-yard run (Caleb Sturgis kick), 14:57. Dolphins 21–17. Drive: 9 plays, 64 yards, 3:39. MIN – Blair Walsh 33-yard field goal, 9:52. Dolphins 21–20. Drive: 9 plays, 64 yards, 5:05. MIA – Mike Wallace 7-yard pass from Ryan Tannehill (Caleb Sturgis kick), 6:39. Dolphins 28–20. Drive: 8 plays, 80 yards, 3:13. MIN – Jarius Wright 8-yard pass from Teddy Bridgewater (Matt Asiata run), 4:46. Tied 28–28. Drive: 5 plays, 60 yards, 1:53. MIN – Matt Asiata 5-yard run (Blair Walsh kick), 4:35. Vikings 35–28. Drive: 1 play, 5 yards, 0:05. MIA – Damien Williams 3-yard pass from Ryan Tannehill (Caleb Sturgis kick), 1:11. Tied 35–35. Drive: 11 plays, 80 yards, 3:24. MIA – Punt blocked by Terrence Fede out of bounds of end zone for a safety, 0:41. Dolphins 37–35. MIN – Blair Walsh 37-yard field goal, 4:59. Vikings 3–0. Drive: 13 plays, 61 yards, 5:25. CHI – Jay Feely 48-yard field goal, 0:55. Tied 3–3. Drive: 9 plays, 42 yards, 2:53. CHI – Jay Feely 25-yard field goal, 13:05. Bears 6–3. Drive: 4 plays, 2 yards, 1:40. MIN – Adam Thielen 44-yard pass from Teddy Bridgewater (Blair Walsh kick), 10:53. Vikings 10–6. Drive: 6 plays, 80 yards, 2:12. MIN – Blair Walsh 44-yard field goal, 11:29. Vikings 13–6. Drive: 5 plays, 27 yards, 2:29. CHI – Jay Feely 35-yard field goal, 8:53. Vikings 13–9. Drive: 8 plays, 18 yards, 2:36. Source for this section: Minnesota Vikings' official website. ↑ CCNorseman (January 5, 2014). "Vikings 2013 Season Grades: Defense and Special Teams". Daily Norseman. Vox Media. Retrieved September 8, 2014. ↑ Sessler, Marc (May 8, 2014). "Justin Gilbert drafted No. 8 by Browns after trade". Around the League (blog). NFL.com. Retrieved May 8, 2014. 1 2 Goessling, Ben (May 20, 2014). "Vikings sign QB Teddy Bridgewater". ESPN.com. Retrieved May 20, 2014. ↑ Patra, Kevin (May 8, 2014). "Vikings draft Teddy Bridgewater after missing Manziel". NFL.com. National Football League. Retrieved May 9, 2014. ↑ Goessling, Ben (May 22, 2014). "Vikings: Scott Crichton tweets he's signed". ESPN.com. Retrieved May 25, 2014. ↑ Goessling, Ben (June 10, 2014). "Vikings sign Jerick McKinnon". ESPN.com. Retrieved June 11, 2014. ↑ Sessler, Marc (March 11, 2013). "Vikings agree to trade Percy Harvin to 'Hawks for picks". NFL.com. National Football League. Retrieved March 11, 2013. 1 2 3 Tomasson, Chris (May 16, 2014). "Vikings sign three of their 10 draft picks". TwinCities.com. Pioneer Press. Retrieved May 16, 2014. ↑ "2014 NFL Draft trade tracker: Details of all the moves". NFL.com. National Football League. May 10, 2014. Retrieved May 10, 2014. ↑ Yotter, Tim (May 21, 2014). "Vikings sign Exum; two draft picks remain". Scout.com. Retrieved May 21, 2014. 1 2 3 4 "Minnesota Vikings Contracts". Spotrac.com. Retrieved May 20, 2014. 1 2 Tomasson, Chris (December 30, 2013). "Minnesota Vikings sign 6 players to reserve/future contracts". TwinCities.com. Pioneer Press. Retrieved January 26, 2014. ↑ "Vikings re-sign CB/PR Marcus Sherels". USAToday.com. March 7, 2014. Retrieved March 7, 2014. ↑ Goessling, Ben (March 11, 2014). "Breaking down Marcus Sherels' new deal". ESPN.com. ESPN Internet Ventures. Retrieved March 16, 2014. ↑ Goessling, Ben (March 7, 2014). "Cassel brings Vikings back from QB brink". ESPN.com. Retrieved March 7, 2014. ↑ Goessling, Ben (March 9, 2014). "Everson Griffen gets $42.5M deal". ESPN.com. Retrieved March 9, 2014. ↑ "Joe Berger: Current Salary Information". Spotrac.com. Retrieved March 17, 2014. ↑ Tabbert, Nick (March 14, 2014). "Vikings Re-Sign WR Jerome Simpson". KSTP-TV. Retrieved March 16, 2014. ↑ "Jerome Simpson: Current Salary Information". Spotrac.com. Retrieved April 27, 2014. ↑ Tomasson, Chris (March 15, 2014). "Vikings do a little juggling, keep Johnson". TwinCities.com. Pioneer Press. Retrieved March 16, 2014. ↑ Tesfatsion, Master (March 5, 2014). "Vikings tender RB Matt Asiata". StarTribune.com. Retrieved March 5, 2014. 1 2 3 4 5 Krammer, Andrew (August 31, 2014). "Vikings moves: MarQueis Gray claimed and practice squad additions". 1500ESPN.com. Retrieved August 31, 2014. 1 2 Zinski, Dan (September 2, 2014). "Vikings Waive Kendall James from Practice Squad, Add Austin Wentworth". TheVikingAge.com. Retrieved September 2, 2014. ↑ Krammer, Andrew (September 16, 2014). "Vikings sign fullback Zach Line to the practice squad". 1500ESPN.com. Retrieved September 23, 2014. 1 2 3 Zinski, Dan (October 7, 2014). "Vikings Cut McLeod Bethel-Thompson from Practice Squad, Sign Pierre Warren". Retrieved October 7, 2014. ↑ Tomasson, Chris (November 12, 2014). "Vikings re-sign Ryan Otten to practice squad". TwinCities.com. Pioneer Press. Retrieved November 12, 2014. 1 2 Hasan, Arif (November 18, 2014). "2014 MINNESOTA VIKINGS: VIKINGS SIGN RB DOMINIQUE WILLIAMS TO PRACTICE SQUAD". VikingsTerritory.com. Retrieved November 18, 2014. ↑ Goessling, Ben (February 7, 2014). "Erin Henderson cut by Vikings". ESPN.com. Retrieved February 7, 2014. ↑ Wesseling, Chris (March 4, 2014). "John Carlson reportedly to be cut by Minnesota Vikings". NFL.com. Retrieved March 5, 2014. ↑ Gantt, Darin (March 7, 2014). "Cardinals sign tight end John Carlson". NBCSports.com. Retrieved March 7, 2014. ↑ Patra, Kevin (March 6, 2014). "Minnesota Vikings release Letroy Guion, Greg Childs". NFL.com. Retrieved March 17, 2014. ↑ Zicarelli, Frank (September 10, 2014). "Argos hopeful aerial game not a lost cause". TorontoSun.com. Retrieved October 1, 2014. ↑ "Packers add free agent DT Letroy Guion". WashingtonPost.com. March 17, 2014. Retrieved March 17, 2014. ↑ Patra, Kevin (August 14, 2014). "Desmond Bishop signed by Arizona Cardinals". NFL.com. Retrieved August 14, 2014. ↑ Breech, John (March 12, 2014). "RB Toby Gerhart agrees to terms on three-year deal with Jaguars". CBSSports.com. Retrieved March 12, 2014. ↑ Tomasson, Chris (March 14, 2014). "Minnesota Vikings: Chris Cook signs with 49ers". TwinCities.com. St. Paul Pioneer Press. Retrieved March 16, 2014. ↑ Wilson, Aaron (March 21, 2014). "Panthers sign quarterback Joe Webb to one-year deal". NationalFootballPost.com. Retrieved March 21, 2014. ↑ Goessling, Ben (March 26, 2014). "Jared Allen heading to Bears". ESPN.com. Retrieved March 26, 2014. ↑ Caplan, Adam (April 16, 2014). "Josh Freeman, Giants agree to deal". ESPN.com. Retrieved April 16, 2014. ↑ Wesseling, Chris (June 16, 2014). "Kevin Williams turned down more money from Patriots". NFL.com. Retrieved June 17, 2014. 1 2 3 4 5 6 7 8 9 10 Glover, Ted (August 25, 2014). "Minnesota Vikings Roster Cuts 2014: Vikings Begin Shaping The Roster". DailyNorseman.com. Retrieved August 25, 2014. ↑ "Chiefs Announce Roster Moves". KCChiefs.com. September 9, 2014. Retrieved October 1, 2014. 1 2 3 4 5 6 7 8 9 10 Tomasson, Chris (August 30, 2014). "Minnesota Vikings: Fred Evans cut, Jamarca Sanford placed on IR". TwinCities.com. Pioneer Press. Retrieved August 30, 2014. ↑ Kirkendall, Josh (October 8, 2014). "Cincinnati Bengals sign Jeff Baca to practice squad". CincyJungle.com. Retrieved November 5, 2014. ↑ Goessling, Ben (September 8, 2014). "Vikings cut Sanford after injury settlement". ESPN.com. Retrieved September 8, 2014. ↑ Jones, Mike (September 29, 2014). "Redskins sign safety Jamarca Sanford, mostly for special teams". WashingtonPost.com. Retrieved October 1, 2014. 1 2 "Vikings sign WR Charles Johnson to replace Jerome Simpson". FoxSports.com. September 20, 2014. Retrieved September 23, 2014. ↑ "Vikings at Packers: Vikings Promote QB Chandler Harnish, waive WR Rodney Smith (UPDATE: TEDDY NOT PLAYING)". VikingsTerritory.com. October 2, 2014. Retrieved October 3, 2014. ↑ Wilkening, Mike (October 3, 2014). "Browns awarded WR Rodney Smith on waivers from Minnesota". NBCSports.com. Retrieved October 10, 2014. 1 2 Tomasson, Chris (January 3, 2014). "Vikings sign free agents Kamar Jorden, Josh Samuda". TwinCities.com. Pioneer Press. Retrieved January 26, 2014. ↑ "Josh Samuda: Current Salary Information". Spotrac.com. Retrieved March 18, 2014. ↑ Patra, Kevin (March 9, 2014). "Report: Minnesota Vikings sign LB Jasper Brinkley". NFL.com. Retrieved March 9, 2014. ↑ "Jasper Brinkley: Current Salary Information". Spotrac.com. Retrieved March 18, 2014. ↑ "Linval Joseph to Vikings for $31.5M". ESPN.com. March 11, 2014. Retrieved March 11, 2014. ↑ Carlson, Adam (March 13, 2014). "Vikings Sign CB Captain Munnerlyn To Three Year Deal". TheVikingAge.com. Retrieved March 13, 2014. ↑ Carlson, Adam (March 19, 2014). "Vikings Agree To Terms With DT Tom Johnson". TheVikingAge.com. Retrieved March 19, 2014. ↑ "Vikings agree with Corey Wootton". ESPN.com. March 20, 2014. Retrieved March 21, 2014. ↑ Gantt, Darin (March 24, 2014). "Vikings sign former Jets lineman Vladimir Ducasse". NBCSports.com. Retrieved March 25, 2014. ↑ "Vlad Ducasse: view contract details". RoroWorld.com. Retrieved April 8, 2014. ↑ "Vikings sign former Texans wide receiver Lestar Jean". FoxNews.com. April 8, 2014. Retrieved April 8, 2014. ↑ "Lestar Jean: Current Salary Information". Spotrac.com. Retrieved April 27, 2014. 1 2 3 4 5 Yotter, Tim (May 13, 2014). "Vikings release four, sign 15 rookies". Scout.com. Retrieved May 13, 2014. 1 2 3 4 Alper, Josh (May 19, 2014). "Vikings sign Mike Zimmer, the player". NBCSports.com. Retrieved May 19, 2014. 1 2 Tomasson, Chris (August 18, 2014). "Vikings waive injured LB Dom DeCicco, pickup LB Justin Jackson off waivers". TwinCities.com. Pioneer Press. Retrieved August 18, 2014. ↑ Tomasson, Chris (September 9, 2014). "Vikings sign linebacker Josh Kaddu to practice squad". TwinCities.com. Retrieved September 9, 2014. 1 2 3 Vensel, Matt (November 3, 2014). "Vikings add two to practice squad, including QB Devlin". StarTribune.com. Retrieved November 3, 2014. ↑ Goessling, Ben (December 7, 2014). "Rookie Jerick McKinnon placed on IR". ESPN.com. Retrieved December 7, 2014. ↑ Tomasson, Chris (December 10, 2014). "Vikings place linebacker Michael Mauti on injured reserve, sign tackle Carter Bykowski". ESPN.com. Retrieved December 10, 2014. 1 2 Gates, Christopher (December 17, 2014). "Minnesota Vikings Promote Ahmad Dixon, Sign Jordan McCray". ESPN.com. Retrieved December 17, 2014. 1 2 Tomasson, Chris (December 24, 2014). "Vikings sign RB Henry Josey off Jacksonville practice squad". TwinCities.com. Retrieved December 24, 2014. 1 2 Goessling, Ben (June 2, 2014). "Vikings claim Julian Posey off waivers". ESPN.com. Retrieved June 2, 2014. 1 2 Goessling, Ben (July 23, 2014). "Vikings cut Nealy, sign Higgins". ESPN.com. Retrieved July 23, 2014. ↑ "Kamar Jorden: Current Salary Information". Spotrac.com. Retrieved March 18, 2014. ↑ Tomasson, Chris (January 23, 2014). "Vikings: Mike Priefer reportedly staying on coaching staff". TwinCities.com. Pioneer Press. Retrieved January 26, 2014. ↑ "Kheeston Randall: Current Salary Information". Spotrac.com. Retrieved March 18, 2014. ↑ Wilkening, Mike (February 11, 2014). "Vikings sign linebacker Simoni Lawrence". NBCSports.com. Retrieved February 11, 2014. ↑ "Simoni Lawrence: Current Salary Information". Spotrac.com. Retrieved March 18, 2014. ↑ Alper, Josh (March 10, 2014). "Larry Dean avoids restricted free agency, re-signs with Vikings". NBCSports.com. Retrieved March 10, 2014. ↑ "Larry Dean: Current Salary Information". Spotrac.com. Retrieved March 18, 2014. ↑ Goessling, Ben (March 13, 2014). "Source: Fred Evans re-signs with Viking". ESPN.com. Retrieved March 13, 2014. ↑ "Fred Evans: Current Salary Information". Spotrac.com. Retrieved March 18, 2014. ↑ Gehlken, Michael (March 13, 2014). "Derek Cox finds new home". UTSanDiego.com. Retrieved March 13, 2014. 1 2 Hall, Brian (April 15, 2014). "Vikings sign TE Reisner, claim LB Manning off waivers". FoxSports.com. Retrieved April 19, 2014. ↑ "Terrell Manning: Current Salary Information". Spotrac.com. Retrieved April 27, 2014. ↑ "Allen Reisner: Current Salary Information". Spotrac.com. Retrieved April 27, 2014. ↑ "Vikings agree to one-year deal with safety Kurt Coleman". FoxSports.com. April 14, 2014. Retrieved April 14, 2014. ↑ "Kurt Coleman: Current Salary Information". Spotrac.com. Retrieved April 27, 2014. 1 2 Tomasson, Chris (August 4, 2014). "Vikings sign veteran safety Chris Crocker, release rookie defensive end Rakim Cox". TwinCities.com. Pioneer Press. Retrieved August 5, 2014. 1 2 3 Krammer, Andrew (July 25, 2014). "Vikings waive T Matt Hall, WR Josh Cooper and add a pair of receivers". 1500ESPN.com. Retrieved July 25, 2014. ↑ Tomasson, Chris (August 6, 2014). "Vikings waive tight end A.C. Leonard". TwinCities.com. Pioneer Press. Retrieved August 6, 2014. ↑ Alper, Josh (June 13, 2014). "Vikings sign Josh Cooper". NBCSports.com. Retrieved June 13, 2014. ↑ Tomasson, Chris (August 26, 2014). "Vikings cut tight end Mike Higgins". TwinCities.com. Pioneer Press. Retrieved August 26, 2014. ↑ Goessling, Ben (August 10, 2014). "Vikings sign tight end Kory Sperry". ESPN.com. Retrieved August 11, 2014. 1 2 Carlson, Adam (September 29, 2014). "Vikings Sign QB Chandler Harnish To Practice Squad, Cut WR Donte Foster". TheVikingAge.com. Retrieved October 1, 2014. 1 2 Zinski, Dan (September 3, 2014). "Vikings Add Cowboys 7th Round Pick Ahmad Dixon to Practice Squad". TheVikingAge.com. Retrieved September 3, 2014. 1 2 Tomasson, Chris (November 19, 2014). "Vikings claim running back Ben Tate off waivers, release MarQueis Gray". TwinCities.com. Pioneer Press. Retrieved November 19, 2014. ↑ Krammer, Andrew (September 1, 2014). "Vikings add a cornerback to fill out the 10-man practice squad". 1500ESPN.com. Retrieved September 1, 2014. ↑ "Bears sign Dixon off Viking practice squad". ChicagoTribune.com. September 8, 2014. Retrieved September 8, 2014. ↑ Zulgad, Judd (September 24, 2014). "Vikings place Matt Cassel, Brandon Fusco on injured reserve". 1500ESPN.com. Retrieved September 24, 2014. ↑ Tesfatsion, Master (October 3, 2014). "Vikings waive QB Chandler Harnish". StarTribune.com. Retrieved October 3, 2014. ↑ Blunt, Terry (November 11, 2014). "Former John Adams football player Rashaun Allen signs with Seattle Seahawks". ESPN.com. Retrieved November 11, 2014. ↑ Sessler, Marc (December 23, 2014). "Ben Tate released by Minnesota Vikings". NFL.com. Retrieved December 23, 2014. ↑ Tomasson, Chris (November 25, 2014). "Tackle J'Marcus Webb rejoins Vikings, replaces Phil Loadholt". TwinCities.com. Retrieved November 25, 2014. ↑ Miller, Chris (December 16, 2014). "Vikings waive J'Marcus Webb". StarTribune.com. Retrieved December 16, 2014. ↑ Glenza, Jessica (September 12, 2014). "NFL star Adrian Peterson charged with injuring his son". theguardian.com. Guardian News and Media. ↑ "Minnesota Vikings Team Statistics". Minnesota Vikings. December 30, 2014. Retrieved December 30, 2014. ↑ "NFL.com Statistics". NFL.com. December 30, 2014. Retrieved December 30, 2014.